There’s a dip and a crest through turn 1 of Spring Mountain’s 1.5 mile track, one of 30-plus configurations offered by the motorsports resort. The natural reaction is to slow down when approaching this asphalt undulation, so as to not upset the vehicle one may be driving. Against natural instinct, I kept the throttle pinned as I darted into the wave, keeping focus on the apex and straightaway just ahead of it. Through the acceleration down and up the disrupting pavement, the 2016 Chevrolet Camaro 2.0T remained composed, and happily whistled all 24 psi through its 2.0L turbocharged LTG inline-four through the apex and to the straight. I dropped the clutch, and entered another gear. It’s perfectly normal to feel skeptical about a Camaro with a four cylinder engine. We don’t have to look too far to reference the Iron Duke four-cylinder engine put in the third-generation Chevrolet Camaros of the early 1980s. Not the best time for muscle cars. But 275 horsepower and 295 lb-ft of torque on tap in the 2016 Camaro 2.0T does command respect. One of the reasons is because of the weight savings of nearly 400 pounds when compared to the outgoing base Camaro, and with more torque on top of that. At roughly 3,340 pounds of curb weight (or a bit more depending on the options), it’s great to finally see the iconic Chevy nameplate go on a significant diet. Yay, Alpha platform. A 2016 Chevrolet Camaro 2.0T also gives something to RWD coupe buyers that Subaru and Toyota never did, and that’s a turbocharger. The after market should swoon over this entry level model just as much as they’re currently swooning over the 455 hp 2016 Camaro SS. And while there will always be the factions that prefer small four cylinder import cars to high-displacement American cars and vise-versa, this particular Camaro could have open-minded customers bridging the gap between the two. Because to just categorize a Camaro as a simple “muscle car” these days is rather dismissive. The sixth-generation Camaro has even caught standard-bearing German brands off guard. Let alone brands from Japan or Detroit. It’s more than the traditional sense of a muscle car. So we have to think of it as more than just a muscle car. Shaking down the 2016 Camaro turbo around Spring Mountain’s track and the deserted roads leading into Death Valley both validated assumptions and revealed some surprises. The 2.0L turbo does provide a surprising amount of punch, with a 5.4 second 0-60 acceleration time — mirroring a 390 hp, 500 lb-ft 1970 Chevrolet Chevelle 454 SS. In Sport mode, the pedal mapping keeps things sharp, and like other LTG applications, there’s minimal turbo lag. Just the same, the engine does wear out after the 5,200 rpm mark or so. Though on short, winding courses, this characteristic is unnoticeable, as the driver would be too busy navigating the constant switch-backs and braking zones. A 2016 Camaro 2.0T would be great for autocross, if the SCCA places it in the D-Stock category, with cars like the BMW 228i and Ford Mustang EcoBoost. And with 245-wide Goodyear Eagle Sport A/S asymmetrical all seasons on Camaro turbos with the LT trim level, the tire selection and size appears generous, and definitely aids in the handling department. And while the suspension is also well adjusted, there’s no magnetic ride control to be found here. At least, not yet. Did I mention the sound of the 2016 Camaro 2.0T? It sounds great. A GM four cylinder exhaust with some personality, you wonder? Yes, finally. I’d go as far to say as the Camaro with an LTG is the best sounding four cylinder from General Motors since the Chevrolet Cobalt SS. A healthy portion of angry little noises with the combination of turbo spool is definitely going to cater to a certain demographic in a way that the European-sounding rasp of the 2016 Camaro V6 or the increasingly unreachable V8 option cannot. The top speed on the 2016 Chevrolet Camaro 2.0T is just under 150 miles per hour, which is plenty for an entry-level model. And with empty roads reaching forward as far as the eyes can see, it’s very easy to channel the inner Hunter S. Thompson as he rockets out of Bat Country. Another reminder that the Camaro 2.0T is an entry level model is the amount of lift felt at high speeds, but we’re sure that there’s some eventual aero accessories coming. At normal speeds, it’s a complete non-issue. The cabin is modern, quiet and even comfortable. 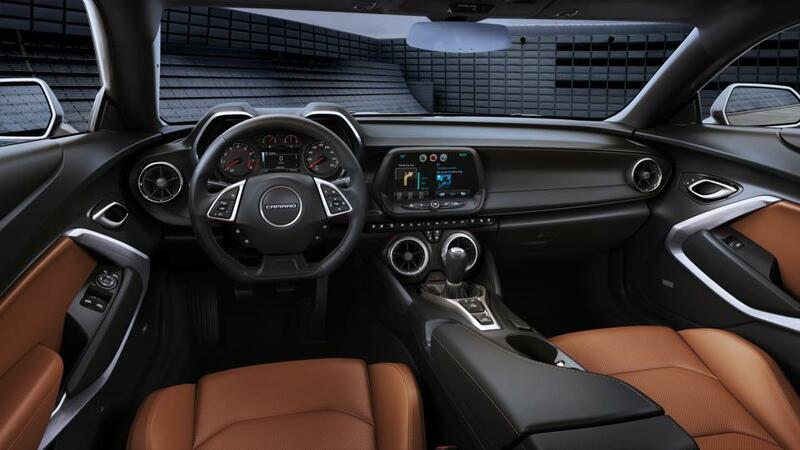 You’ve probably already read somewhere that visibility is about the same as the fifth-generation Camaro, so it takes some time to get adjusted when it comes to routines like parking. The seats in the 2016 Camaro 2.0T tester driven were not the Recaros that can be acquired in the 2016 Camaro SS, though they sufficed for our long cruise into Death Valley, where something called the Super Bloom is happening. The desert floor bordering the road was filled with flowers, which is astonishing to think about, given the extreme environment. At a starting baseline MSRP of $25,700, the 2016 Chevrolet Camaro 2.0T slots just above a (less athletic) 2016 Ford Mustang V6, and a stone’s throw away from a Subaru BRZ. Which is far less car for the money. It may be a different Camaro from what the world has gotten used to, but that’s the exciting part. So the next time you visit a Chevrolet dealer that has a Camaro turbo on the lot, don’t scoff at it. Give it a whirl. This is a car people need to keep an open mind about. This is a car you really need to drive to understand as the Eco Turbo is not like the turbo engines of the past. Direct Injection and more advanced cam timing along with higher compression and Better turbos this engine is a blast to drive. I have seen other reports showing the 5.4 time and that is good the weight is 3300 pounds. The key to this car is the torque and the flat torque curve where it pulls like a V8. It has more torque than the V6. In daily street driving the Turbo 4 would be the car that would be more fun to drive from light to light. While the Eco Turbo sound good for a 4 cylinder with the factory exhaust it can get raspy with aftermarket exhaust and will never capture the sound of the V8 or 60 degree V6. If anything that is the only let down. This car can be optioned up for around $27,500 well and provide a great performance bargain. I think with the pricing this is why you have not seen a Cruze SS as this is a much better package to take advantage of the torque of the engine. My FWD struggles to gain traction. My SS is proof that FWD does not provide better traction as it will unload and break loose the tires up to 50 MPH. If they would offer a 1LE package here for $35K -32K that could be a performance bargain that few could match. I was a never take my V8 guy for years but I have been really smitten with the Eco Turbo. Mine is faster than any stock Big Block V8 I have owned and as fast as some modified Small Blocks I have owned. Tune kits should do much here and if GM does not offer them someone will. There are quite a few Cobalt SS/TCs that sound pretty darn good for a 4-banger, you’d be surprised. I’m glad the 2.0 is getting some attention, in my opinion it’s very underrated. The previous iterations got those FWD Cobalts up to 60 in under 5 seconds as well (including the supercharged LSJ). Yes, they were lighter, by about 300lbs, but they also had lower power outputs – 205 for the SS/SC and 260 for the SS/TC (I can’t speak on tq figures). I have a hunch that these engines will lead the “yay turbo 4” crowd (yes, that includes me) to become very interested in the ATS 2.0’s as well, not to mention that an ATS would potentially mean AWD. Downside to AWD for some would be the A/T. You can find these in the $15-$20K range already – sweet spot between a used Cobalt SS and new Camaro Turbo. ZZP already has aftermarket support for them as well. I have a HHR SS with the upgrade and I love the stealth effect on people when you have a guy in a Mustang GT take off an you keep right up with him. They usually have to pull over and ask how you did that. I sit at 295-300 HP with 315 FT LBS that pull from 1800-5300 at 23-24 PSI on pump gas. It is a daily beater and is a blast. I just wish it were RWD. If I can hook up I can dip into the 13’s. Wheel spin is a problem and the launch control just makes for slower times. I have not gone top end but others have easily cleared 150 in the little tin box. That is a little fast for me for a car like that. Cars at that speed can get a little funky with the air. The new Camaro is one car that will surprise many who can get over their piston envy. I used to be a nothing but a V8 guy and now I have many engines I love because I got over it. The torque in this engine is much like a 428 Pontiac a lot of low end grunt. Those who want to complain about lag and what ever excuse really show they have never experienced the new Eco Turbo in a performance model. The Solstice with the tune can get 340 FT LBS due to the stronger transmission. I know from GM documentation that the LNF will go 400 HP with no changes and just tuning. After that only rods and pistons are needed for some more and only a few other parts to make a reliable 500 HP. I would expect this engine is much the same and the new transmission we already know is stronger. I would only really be concerned about the drive shaft and rear axles until we could confirm what they are running. I know Ford used lighter parts in their past smaller engines and I am not sure if GM did or not. I saw guys with the Mustang taking off the speed limiter and trowing drive shafts and putting holes in the pan. Seems the limiter was there for a reason lOl! I agree about the LTG being a great engine for tunes. I also agree about the Cruze/Sonic not *needing* the LTG… but I wish there was something better than the 1.4T available, especially for the new Cruze hatch. The Sonic hatch looks kinda dumpy (I drive one), but the new Cruze Hatch looks nice and aggressive. It needs a bit more power to match that aggressive look. I agree that they should get a bump. We may see the new engine that is in the new Encore sport show up there? I would love to see the hatch do a Ford RS like thing but the price will be a real killer. The RS while a wonderful car start near $37K and can go over $40K. GM would have to leverage this globally and I don’t see Chevy pulling that off. Now you could do it with a Buick, Opel, Holden and get the volume to make it pay off. Ford gets away with it because of Euro sales. Once you hit 300 HP in a small car like this you really need RWD or AWD as FWD just does not cut it. One of the Chevrolet engineers recently said that while it is possible to beef up the LTG to get over 300 horsepower from the 2.0L DOHC-4v 4-cyl engine; they said adding another 50 hp would require strengthening the chassis to handle the extra power and would translate to a more expensive car. Who knows what the future may bring as the Camaro of 2026 may be a fuel cell plug-in hybrid as the only difference between the SS and the LE will be the power of the electric motors. Can you provide a link to this alleged engineer’s statement? I’d like to read it as I find it implausible that the chassis needs any strengthening as it easily handles the v6 335HP and LT1’s 450HP being the same alpha platform. I certainly hope this engineer is wrong as the 2.0 equipped camaro’s may be awesome long term LS swap candidates being the low man on the totem pole and depreciation. Not to mention an older high mileage or previous rental car could make excellent LS swap candidates, IMHO. I speculate this is wrong too but in the case of the V6 Mustand the drive line is not able to hold up with the performance of the car. They had a speed limiter on the last version to keep from tossing the drive shaft. There is a video where the guy took out the limiter and tossed the drive shaft through the floor. If that is all it is these things can be handed very easily. The actual platform is not really adjustable so I expect that it should be up to the task. If not parts will be offered by the aftermarket to deal with it. I understand and concur but I wasn’t pointing out any ford deficiencies. I actually forgot the v6tt 464hp variant of the caddy ats-v on the same platform. I suspect this “engineer”, is not, and obviously, as you point out, that the base platform should be up to the task and perhaps even more I might speculate. Suspension tweeks/mods/conversion will be needed based on HP/TQ level desired, obviously, and glad to hear your skepticism as well, unless we blatantly missed something. People need to get over their piston envy and embrace this muther! 0-60 in 5.4 sec is really good for the LTG. I drove Buick Regal Turbo with the same LTG, and it is also quick by sedan standards, but it is nowhere near these numbers. Yes, I know, totally different vehicles of different weight, totally different platforms, Regal is FWD (or FWD-biased AWD) in contrast to Camaro’s RWD, so one shouldn’t expect performance similarity, but still.